Many people new to Facebook advertising confuse boosted posts and ads created through Ads Manager. Here’s the breakdown. Boosted posts are posts in your page’s timeline that you apply money to so the post is more visible in your audience’s Newsfeed. The most common goals of boosted posts are to increase brand awareness and post engagement. Facebook ads are direct-response ads you create through the Ads Manager platform. They are highly targeted and have designated conversion goals with clear calls to action. Boosted posts and Facebook ads are both paid advertisements. When you get billed, both are designated as ad spend. The big difference with a boosted post or other posts you promote through your business page is that you can create them with just a few clicks. If you’re looking to promote something on the fly, this is an advantage. 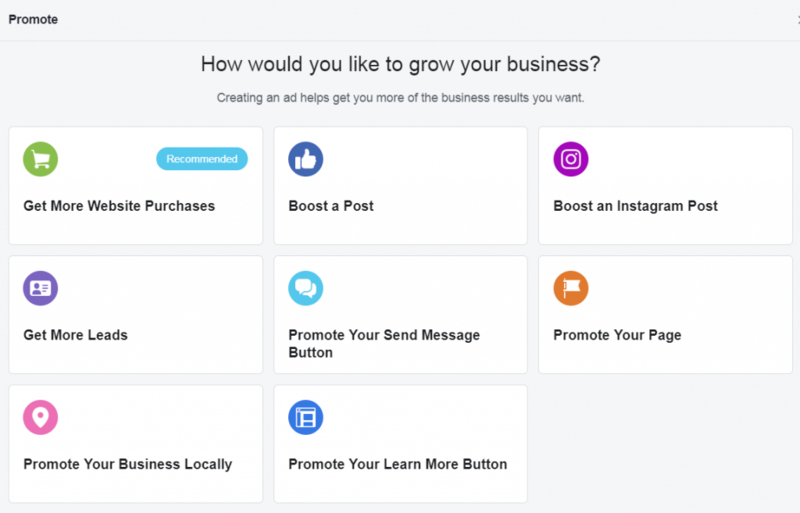 A Facebook ad requires that you create a campaign through the business manager interface. The process is more complicated and labor intensive. You need a strong idea of what type of creative you want to use in the ad and how you want to target your audiences. With just a few clicks, you can boost your post or use one of the other promotions. Ads manager is another animal. You’ll need training on how to create and manage ads, and the overall effort required is far greater. However (as we’ll discuss), you’ll get better results with this tool. If you’re new to Facebook advertising, be particularly careful if you start playing around with Ads manager. This is a complex tool. When you don’t know what you’re doing, it’s easy to make mistakes. We’ve had a lot of novice advertisers come to us dejected after they played around with Facebook ads and their budget with no results. 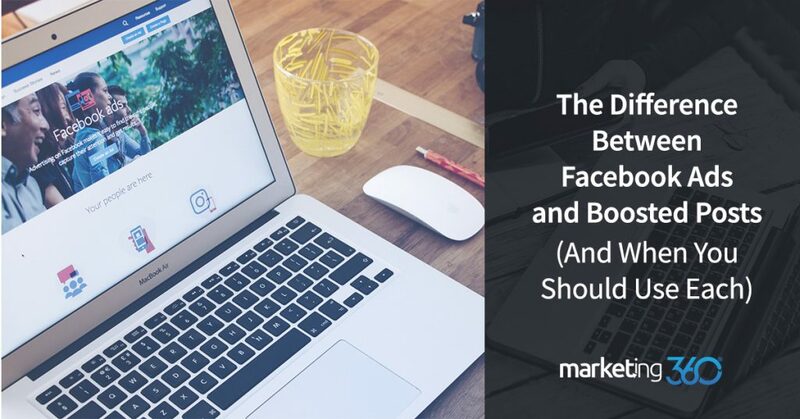 If you’re just getting started with Facebook advertising, try boosting some posts and running basic promotions first. Limit your budget so can test ads without over-spending. One of the keys to Facebook advertising is to start with your goals. What you expect your ads to achieve dictates the type of ad you’ll develop and the level of exposure you’ll invest in. So let’s take two scenarios to illustrate when you might boost a post versus when you should create an ad campaign. In the first, you have an organic post you created for your business that got a lot of reactions from your followers. You create another post with a similar theme, and this time you’d like it to show to not only people who like your page but also their friends. Your goal is to get more exposure for the post and increase reactions. Boost this post through your business page. However, say your goal is to increase website sales for a perishable item that you have in excess inventory. You need sales conversions fast. In this case, your goal warrants the use of the Facebook ads run in a fully developed campaign. Here’s an important tip based on insider information from Marketing 360®. There are two things at work. The first is that you have more precise ways to target, place, and create ads in ads manager. You have far more latitude with how you create and test ads. And consider this. You could create basically the same ad with the goal of driving traffic to a website page with each of these tools. But the ad you create in ads manager will get more exposure. The algorithm that places ads sees content created in the manager tool as premium and ads created through the business page as secondary. Marketing 360® runs all our ads and our clients’ ads through ads manager, even when the goal is just branding or engagement. It takes more time, but the tool is more robust. We know we’ll get more exposure and results through this tool. To dabble and learn, boosted posts and promotions through your business page is okay. You can get started and get a feel for Facebook advertising. However, once your goals get serious, create your ads manager profile and use it for your advertising. It’s the tool for serious marketing campaigns, and it will deliver the results most businesses are looking for.